6Then I saw between the throne and the four living creatures and among the elders a Lamb standing as if it had been slaughtered, having seven horns and seven eyes, which are the seven spirits of God sent out into all the earth. 7He went and took the scroll from the right hand of the one who was seated on the throne. 8When he had taken the scroll, the four living creatures and the twenty-four elders fell before the Lamb, each holding a harp and golden bowls full of incense, which are the prayers of the saints. 9They sing a new song: “You are worthy to take the scroll and to open its seals, for you were slaughtered and by your blood you ransomed for God saints from every tribe and language and people and nation; 10you have made them to be a [single!] kingdom and priests serving our God, and they will reign on earth.” 11Then I looked, and I heard the voice of many angels surrounding the throne and the living creatures and the elders; they numbered myriads of myriads and thousands of thousands,12singing with full voice, “Worthy is the Lamb that was slaughtered to receive power and wealth and wisdom and might and honor and glory and blessing!” 13Then I heard every creature in heaven and on earth and under the earth and in the sea, and all that is in them, singing, “To the one seated on the throne and to the Lamb be blessing and honor and glory and might forever and ever!” 14And the four living creatures said, “Amen!” And the elders fell down and worshiped. This weekend, in the U.S., churches will be filled with civil religion as the civil part of the liturgical year (Memorial Day to Thanksgiving), as practiced here, kicks off. 2. Do not sacralize war. War is not a holy enterprise, a crusade led by God and God’s representatives on earth, but a human project caused by failures and full of evils, no matter what its rationale or outcome. 3. Do not make war salvific or Christian by misapplying Jesus’ statement in John 15:3 about his own loving death and about radical discipleship (“No one has greater love than this, to lay down one’s life for one’s friends”) to war-deaths. 4. Do not let anyone leave the church thinking that any nation is the kingdom of God, or that any nation deserves the unqualified allegiance and praise due to God alone. 5. Do not let anyone leave the church thinking that there is anything more important than worshiping God and following Jesus Christ in the power of the Spirit. Make sure everyone leaves the church knowing it is Easter season and Pentecost is around the corner! It is the season of life and peace and promise. It is so easy to mock the pending doomsday prophets, but we are terrible Christians if we don’t feel a profound sense of sadness for these creatures made in God’s image. The whole situation feels ridiculous, but to the people who are truly hoping for God to rescue them on Saturday, this is not a simple matter; we are talking about people’s core beliefs about who God is and how God acts in the world, beliefs that will be ruptured, not raptured, come Saturday. The appropriate Christian response is not to condemn or mock the followers of this skewed religion, but to live an articulation of God’s current and impending restoration of all that was declared good. We can declare in word and deed that we are not hoping for a rapture to deliver us to some distant world while leaving the rest behind, but for an in-breaking of God’s space into ours, that we may be enraptured by God’s presence amid this place. This is the dream of Scripture so beautifully breathed by God. Its haunting truth can make us quake in awe, not terror, of a God who invites us to join in by being joined to the church, Christ’s body on earth. May the purifying fire reign down and rain down on us through a fascination with the mystery of Christ’s death and resurrection, a fire that consumes what is evil and broken and leaves us cleansed vessels. May our lives be a burning bush, animated by this fire yet not destroyed, illuminating a dark world. Family Radio is proffering a dangerous ecclesiology. No, that is not a typo. I did not mean to say “eschatology.” A number of people have been wondering why I have not blogged about the eschatology of Harold Camping and Family Radio. My answer would be that its obviously misguided character does not need another critique from me. But I think we should be much more concerned about the “movement”‘s ecclesiology, or lack thereof, because that is what will not be left behind when we are all still here on May 22. A few days ago I received in the mail, with no return address, two pamphlets from Family Radio, each dated 2009. One announces the coming end of the world on May 21, 2011, gives the biblical “proof” for this date, and recommends that all readers beg God for mercy. The other pamphlet is entitled “Does God Love You?” In a series of 14 questions and answers, the pamphlet begins with a quote of John 3:16 before quickly shifting focus to God’s anger and judgment. The word “love” with God as subject does not appear again after question 1. The “good news” is that if readers diligently read and study the Bible, they might eventually find out that God will be merciful to them, because (how or why, is not clear) of Christ’s substitutionary death, and they may be counted among those upon whom God will be merciful–the saved. In the meantime, all that sinners can do is read or listen to the Bible, God’s “Law book,” so they will be in a “place” where God can save them. There is no assurance of salvation, only the possibility that God might save us; obedience to the Law book is the evidence that one might be among the saved. we learn from the Bible that God is no longer saving people through the ministry of the churches. The church age has come to an end. Fact is God commands in His Law book, the Bible, that true believers are to leave their church. This is because God’s righteous judgment is upon all local congregations as God is preparing the world for Judgment Day…. The Bible teaches that at this present time, when we are very near the end of time, that it is outside the churches that God is saving a great multitude of people. A quotation and misinterpretation of Matt 24:15, 16 (identifying Judea as “the local churches”) and quotations of 1 Pet 4:17 and Rev 7:9 underwrite this (non-) ecclesiology. I do not have the time or energy to critique the problems with this soteriology and non-ecclesiology. But if you ever wonder after May 21 why so many people are absent from church, it will not be because they have disappeared into the rapture zone. It will be, in some cases, because they have disappeared into the wrath-filled zone of certain forms of “Christian” radio. Tom Wright has submitted the following surprisingly strong text to the Times of London. Perhaps the myth was necessary in the days of the Wild West, of isolated frontier towns and roaming gangs. But it legitimizes a form of vigilantism, of taking the law into one’s own hands, which provides ‘justice’ only of the crudest sort. In the present case, the ‘hero’ fired a lot of stray bullets in Iraq and Afghanistan before he got it right. What’s more, such actions invite retaliation. They only ‘work’ because the hero can shoot better than the villain; but the villain’s friends may decide on vengeance. Proper justice is designed precisely to outflank such escalation. I am indebted to my friend Mike Bird at Euaggelion for pointing this out. Mike thinks that terrorists fall outside the the rules of war and therefore permit nations to do what the U.S. has done. 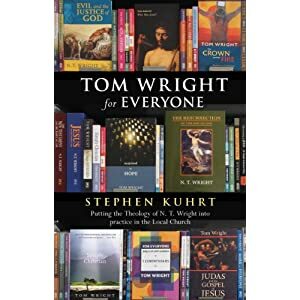 But Wright, who has not identified with the pacifist position in the past, makes good points about functional American exceptionalism (that is, even if other countries do such things on occasion, the U.S. would not approve of it if the shoe were on the other foot) and about core American myths, and he brings the most fundamental Christian perspective to bear on this issue. No, that’s not a typo but the title of a new book from SPCK. I guess this was inevitable! Hopefully Miroslav Volf’s online piece for the Christian Century will appear later today. (On FB he has posted the first and last paragraphs.) In the meantime, lots of good reflections have appeared, including those listed here by Church of Christ minister David Smith, as I commented last night. Two main, interrelated thoughts have struck me since yesterday. First, the common theme in Congress, in the media, and on the streets seems to be that this event has pulled the diverse and factious body of people called Americans together like nothing else in a very long time. That should give everyone, Christian or not, at least a little ethical hiccup. How sad is it when the killing of a human being is the chief cause of human unity, even for a day or a week? But wait–and here is the irony–for us who call ourselves Christians, the killing of a human being actually is the cause of our unity, only for us it is the being killed rather than the killing, the heroic role of victim not victor, that is the source of unity. Which leads to my second main point. The values that are drawing Americans together at this point are not, as some have tried to argue, the high moral values of justice (in a philosophical or theological sense) and commitment to the good of the world. No, they are the old-fashioned values of nationalism, retaliation, vengeance, kick-a** power (witness the Naval Academy plebes’ video), and “American” justice, complete, in some cases, with a strong dose of civil religion. That these are not gospel values should go without saying, yet many Christian Americans are blinded to this truth by this powerful, seductive nationalism. Osama bin Laden, as we all know, bore the most serious responsibility for spreading divisions and hatred among populations, causing the deaths of innumerable people, and manipulating religions to this end. In the face of a man’s death, a Christian never rejoices, but reflects on the serious responsibilities of each person before God and before men, and hopes and works so that every event may be the occasion for the further growth of peace and not of hatred. This is relatively minimalist, but good. Would that American Christians could at least take this statement as their starting point. Do the horrible events of 9/11 justify murderous retaliation? What is the Christian community to think? And don’t forget: a son and several grandchildren were murdered in the failed attempt to kill another enemy of the state two days earlier. Apart from the question of morality, is a weekend of state killing the best way to prevent future deaths?